provides easy access to international flavors. It all started with the bees. After a swarm took up residence at Arthur Shwarts’ California home, he decided to work with them instead of against them. He set up hives on his property, and the honeybees started producing especially delicious honey. Eventually Arthur’s backyard hobby turned into a business, with 90 hives and an annual honey harvest of more than two tons. Golden Hex Honey was born. Three years ago, on a college scouting trip with his son, Arthur visited Chapel Hill and fell in love with the area. Within two months, he and his family left northern California for North Carolina. They soon noticed a shortage of European markets in the area and, deciding to expand on the Golden Hex brand, they opened Golden Hex European Groceries & Deli in March. 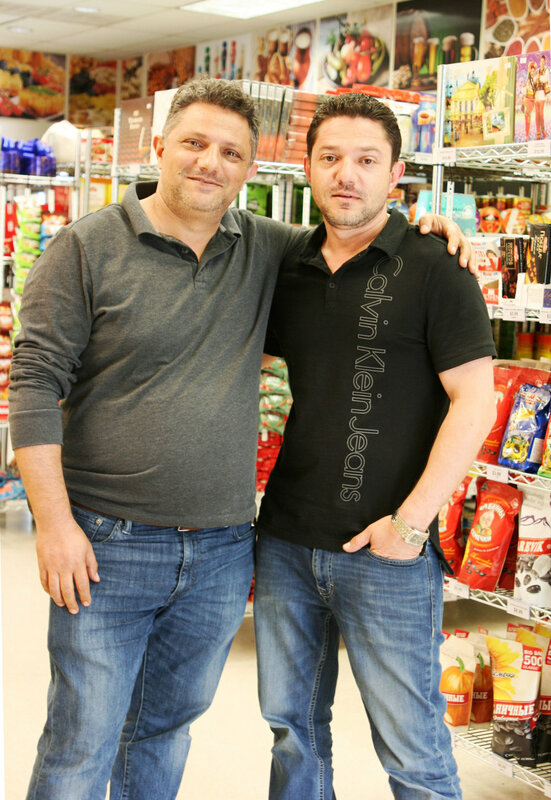 Arthur and his brother, Erik, co-owner of Golden Hex, were born in Armenia and lived in several countries before moving to the U.S. Arthur explains that ethnic markets provide a piece of home away from home, especially for those who do not have family living nearby. Missing traditional foods from their native countries, shoppers come in looking for items that remind them of home. They are surprised to find so many unique products offered, and are especially happy when they find something they’ve been looking for and haven’t been able to find in this market. When you walk into Golden Hex, the first thing you notice is the welcoming atmosphere. Next your eyes are drawn to the tidy shelves holding colorful jars of pickled vegetables and many varieties of honey, including Golden Hex Wild Raw Honey. In addition to traditional European cheeses and dairy products, a large refrigerated and frozen food department offers a vast selection of Russian dumplings, Mediterranean burekas, and pierogies, each with a myriad of fillings. Large metal shelving units hold household staples like grains, spices, teas, condiments, and preserved fruits. Golden Hex also has a great selection of beer and wine from across the Baltic region as well as a small offering of beeswax candles, souvenir gifts, chocolates, snacks, and candies. Arthur plans to add more varieties of food to the 16 cultures now represented. “This is a small space, so there’s room for only the best and most popular,” he says. He’s noticed a demand for natural health remedies, so he’s hoping to add an herbal and homeopathic medicine section soon. He also wants to offer his customers a prepared-food department, but that will have to wait for a larger store. The shrewd businessman’s face lights up when talking about the size of Russian supermarkets in large cities such as Brooklyn, New York, and St. Louis. Arthur doesn’t have a concrete plan yet, but he says growth is the ultimate goal for Golden Hex. After years in the corporate world, Arthur enjoys the independence of working for himself. However, that means he and Erik work long days—sometimes 16 to 18 hours—but as Arthur explains, “Even if I feel tired, I am fulfilled.” He enjoys talking with customers, telling them stories and jokes, and hearing about their lives. Lilia, Arthur’s wife, manages communications and the social media platforms that are necessary in today’s business world. The couple also organizes game nights, picnics, and cultural festivals to bring the Triangle’s Eastern European community together. As for the origins of Golden Hex: Arthur still maintains a few hives at his Chapel Hill home. “People can learn a lot from bees. How they organize their lives, work together, and everything. It’s amazing! I wish humans would live this way,” he says.